When I received this book, it took me a few minutes to open it as I was thinking if I were someone who had purchased this book, would it be before or after I got my iPad. So I pondered a bit, picked up the iPad and tooled around with it a bit, then set it down and picked up the book. I immediately found myself caught up in...does it cover this, does it cover that, did he mention this and by the time I put it down I realized "WOW, there were things in there that I'd not only not seen, but found to be very useful." The surprising thing is that I've had my iPad since the day they came out. Mine was delivered that very first morning in April by UPS along with a "Congrats!" from the driver. I asked him why and his response was simply "Dude, we've got hundreds of these out on trucks this morning and yours is the first one on my route to be delivered!" So the book is very thorough. It covers the iPad very well, and in detail that not even the online documentation does as that's never fun to read. This is as you can flip through it and with the ipad near you, you can move through the book and see things, as well as touch, swipe, pinch, and prod (my word) the content of your iPad so that it suits you. Something else I love about this book is the printing using a "lay flat binding" which is a nice job by the printers. Once you're all setup and working, the book makes a great reference guide to go back to and refer when you're looking for that one thing that you thought you knew how to do, but could not find in the iPad itself. Am going to rate this book a 9 out of 10 as there was one thing that I thought was missing and that was in showing screen images I think it's important to clarify to a user that in landscape mode you'll see a certain representation, while in portrait mode you'll see a different view. That's really the only thing I can see to improve on in here. I would not worry about doing anything in this in color as one has the ipad in color so it's not like having the book be that would add anything to it. In fact it would probably take awawy. I love that the author covers not only the iPad, but also those tools that the user will need to use to get the best experience out of the iPad. This to me makes this book an invaluable resource. It will be fun to see it evolve in the next edition when iOS4 becomes available for the iPad as well as to see the errata website be updated with new and exciting information as the iPad moves from infancy to maturity in our world. A pleasure to read. If you have an iPad you'll be well served to get this. 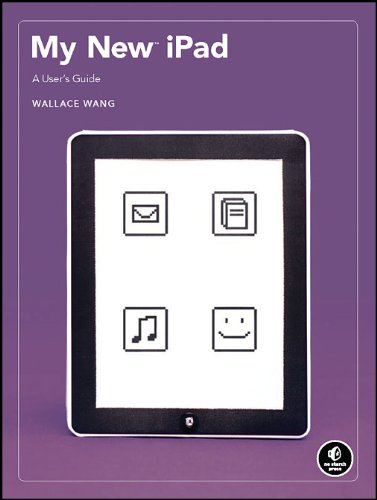 If you're thinking about getting an iPad then this book is a great intro to the platform you're about to welcome into your life and will show you why the iPad is very far from being "just a larger iPhone". Get your copy today at http://orielly.com/nostarch or http://www.nostarch.com or http://docmurdock.com/store.htm or other booksellers around the globe.